Profile: When Hurricane Ike made landfall in Galveston on September 13, 2008, one of the hardest hit institutions was the University of Texas Medical Branch. 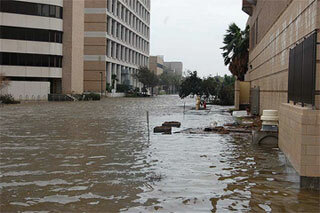 The storm flooded every building on the campus, causing an estimated $800 million in damages and lost revenue. One component of the utility system that was severely affected was the Outside Plant (OSP) pathways and cabling. This means of conveyance provides copper and fiber connectivity throughout the campus. The cable infrastructure, housed in underground conduit, manholes, and duct banks, was completely inundated with seawater and remained submerged for 30 to 60 days. This resulted in damage to both the cable and splice points beneath the core hospital building group. Services: DataCom Design Group was selected as part of a comprehensive design team to provide consulting for IT and Outside Plant involving an investigation of the water-damaged cabling system to mitigate further damage. Our scope included the development of detailed drawings and specifications to facilitate rerouting and reconfiguration of the campus-wide system.